During this time of financial turmoil, with the country’s economy sprinting towards recession, Stony Brook University MBA student (and former Treasurer of The Library Club) Sinan Cinar examines the textbook “The Intelligent investor”, which covers the ins and outs of smart investing. This book doesn’t tell us how to beat the market. Instead, the purpose of the book is to supply, in a form suitable for laymen, guidance in the adoption and execution of an investment policy. Comparatively little was mentioned here about the technique of analyzing securities. There are three major topics which book is trying to accomplish. · How we can control the self-defeating behavior that keeps most investors from reaching their full potential. This book is pretty good guide for professional and non professional investor. To be an investor, you don’t have to be very knowledgeable about finance. If you read the book, even people who don’t know anything about stocks invest money into stocks. But they should consider the advice provided in the book. 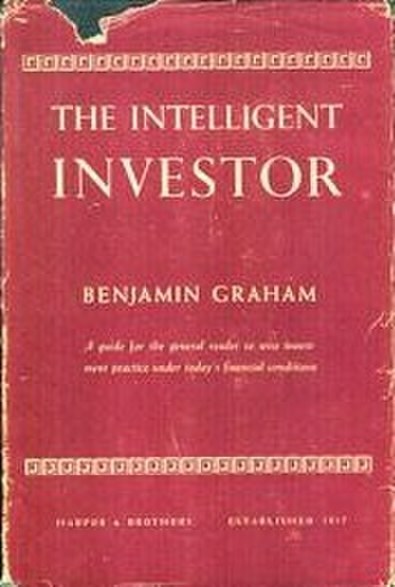 Graham states that there are two types of investors that are considered. One of them is a defensive investor and the other one is an enterprising investor. The defensive investor should follow some steps if he doesn’t want to hit the wall in the first attempt. The biggest advice for the defensive investor is not to take higher risk. To control the risk level, the investor should keep some proportion between stocks and bonds in this portfolio. This range changes between 25% and 75%. It means that the investor should invest at least 25% or highest 75% to stocks and rest of proportion should be invested to the bonds. This proportion may change according to the condition and the risk level of the market. Also, if the investor is not successful to pick the right stocks and bonds, he should take professional advice from the professional brokers and portfolio managers. It is very important because if you don’t know how to go somewhere, you should take some help from the map and this map in this situation is professional portfolio managers and brokers. For the enterprising investor, the steps vary a little bit according to the defensive investor. The book mentions that if we want to be enterprising investors, we should devote most of our time to analyze and collect the right information about the stocks. Further, the investor should do a lot of practicing before investment. Actually, the book doesn’t guarantee the higher return in the investment but at least, it gives lots of useful tips how to be a successful investor and to protect ourselves from the risk in the investment. Further, it defines our common mistakes and delusions in the investments. One of them is patience. Firstly, the investor should be patient and should invest for the long run. Secondly, the investor shouldn’t invest emotionally in the stock market. Finally, we should also prepare ourselves for the bad results and determine the risk level which we afford to take in the investment. While I was away in Spain, I took all Spanish literature classes and so learned quite a bit of the Castilian literary heritage. One of the authors whose works I read was the playwright, Lope de Vega, who is basically the Spanish equivalent of Shakespeare and was renowned for his poetic diction, colorful characters and his intricate plots which the masses could enjoy. One of his plays that most impressed me was Fuente Ovejuna, the translation of which might be something like Sheep Fountain or perhaps even Sheep Well. Now, I must caution that I will provide a full synopsis of the play below so for those of you who do not wish the story to be spoiled, I suggest you stop reading now and simply take out the text from the library or watch its many film versions. Of course, it would be better to see it in Spanish but I believe English versions of the play are available, but as with most translations, the original beauty of the diction may be lost. I will end this introduction before going on to the plot by saying that for those of you who enjoy Baroque theater, a strong female character, and bloody vengeance during an awesome rebellion, then Fuente Ovejuna is right up your alley! Anyone who has not been living under a rock for the past few decades would easily recognize that one of the major social issues facing the United States today is that of immigration or rather its illegal counterpart. What many seem to forget, however, is that besides boiling the tumultuous pot of job availability in this country, illegal immigration’s affects seep into more subtle areas of society such as education, concentrating mostly around ESL programs. Like stubborn and unsightly weeds, burning questions never seem to die around these English classes for newly arrived, legal or not, foreign students, such as: what should be taught in these courses? How should they be taught? Who should teach them? And, most importantly in the minds of taxpayers, how should these courses be funded? While not providing solutions to all the above perplexing problems, Guadalupe Valdés does portray the overall predicament concerning ESL programs with California during the 1990’s as a backdrop for her observations in her book Learning and Not Learning English: Latino Students in American Schools. At first sounding formal and very academic in the first few chapters where she depicts the context of her research, the author’s tone softens to a more story-telling style when she continues to describe the experiences of four Latino students enrolled in ESL programs at various levels. It would appear that this change in writing technique makes the reader suddenly remember that he or she is not just reading information for which to develop personal opinions or approaches toward literacy development for English language learners, but that the lives and eventual fate of younger generations, of real people, are involved, as well. The more novel-style reading does not lead to, however, fanciful or happy-go-lucky endings for the students she discusses, as Valdés pointedly notes in her introduction. While admitting also in her introduction to subjectivity only because she had gone through the same experiences as her subjects, Valdés presents a sugar-free portrayal of the deplorable situation of many if not all ESL programs in the United States. Thus, I think by reading Learning and Not Learning English the reader will gain a practical knowledge on the topic at hand through a perspective unspoiled by alienating and snobbish scholarly language that might ruin or divert attention from the ultimate consequence of the decisions produced in response to this question. Going to Stony Brook University on Long Island, so close to the infamous Farmingville where the predicament over illegal immigration most particularly fomented and inspired the documentary by the same name, Learning and Not Learning English is certainly relevant to what exists in the schools in our area. Thus, this book might be a reminder to many that we are not immune to one of America’s most difficult issues. Have you ever wondered what would happen if you stuck five sisters ranging from the ages of twenty to forty and who almost all have the hots for the same bachelor with their busy-body domineering widowed mother in a provincial manor house during an unbearably hot summer? Oh, and don’t forget the stipulation that the mother is forcing her daughters into a period of mourning for eight years during which they can never leave the house and must wear stifling black dresses. All of this taking place, of course, in a small, insignificant town where the slightest social faux pas can ignite the most violent of scandals. If you have been tortured by such a perplexing and haunting scenario, worry not! Thankfully, Federico García Lorca has already explored the possibilities for the outcome of such a predicament for you in his play The House of Bernarda Alba. Originally written in Spanish but graciously translated time and time again into English, The House of Bernarda Alba not only provides the resolution for the above stated issue, but does so in a suspenseful and dramatic manner. Conflicts between desire and repression, self-expression and conformity and (the icing on the cake) gender issues are analyzed through this play. Although some of the striking flare and bite of the diction in Spanish is somewhat lost in the English translations, the overall impression of the play is still felt. So, I would recommend reading this play to anyone interested in the aforementioned thematic questions or for anyone who thrives on plots involving back-stabbing, selfish motives and dirty little secrets. The House of Bernarda Alba is a pleasure to read and see on stage for both the everyday entertainment-seeker and the intellectual. Music is the universal phenomenon of peace and mankind. This was re-affirmed at the concert held at the Wang Center, Stony Brook on Wednesday evening. The singer, Dr. Salman Ahmad is a Pakistani doctor who changed profession for his passion for music. After listening to the amazing music of the Pakistani rock star Salman Ahmad and his answers to many interesting questions, I was really curious about music in South-Asian countries and I am also sure that other students were too. Events like these help the students understand the role of music and musicians. For example, Salman Ahmad is the Goodwill Ambassador for HIV/AIDS in Pakistan. Not only is he working towards spreading awareness about HIV in South Asia, he is also helping to bring peace between Pakistan and India as an artist. If not the music, such events generate some sort of tolerance and curiosity for different religions, cultures and people. I have been to other Asian-American events and I get the same vibe from all of them. To quench my curiosity, after the concert I went back home and saw the movie which we were going to see during the concert; “Islamabad: Rock City”. The movie is a story of a very unlikely rock band who managed to defy politics, culture and fundamentalism all in the name of music. After attending two events Sufi Rock and Taxi to the Dark Side, I get a sense of equality and parity. While Taxi to the Dark Side tackled a very serious problem related to humanity and ethics exercised by a war-torn country. The Sufi Rock concert gave a sense of belonging and a feeling that even in this world in war, there is still room for love and respect for other cultures, other religions and other people. Born in a Thai refugee camp on the Cambodian New Year, documentary filmmaker Socheata Poeuv was deemed by her family “the lucky one,” fated to good fortune. She never witnessed the brutal oppression and genocide under the Khmer Rouge but she knew that her parents had survived through the cruel and inhumane Khmer Rouge rule. Although living in Texas suburbs 25 years later (today), Socheata was impelled to confront and give a human face to her childhood shadows. She travels to Cambodia with her parents to unravel the mystery shrouding her family’s survival and eventual escape. When I compare the Cambodian-American experience to the Chinese-American I see some striking differences. The first and the most obvious is how they ended up here in America. While the Chinese came here in search for job and as sojourners, the Cambodian nationals came here to seek for asylum from the brutal Khmer Rouge regime. I can also imagine that because of this reason, the attitude of the Americans will also be more sympathetic towards the Cambodians. I think it is really important to know your past and your roots in order to truly explore your identity. In this case, Socheata was curious about the history of her parents who sacrificed so much for “the lucky one”. Towards the end of the movie and from the interview, it was very noticeable that Socheata had new values for her parents and a much better understanding of her past. Even in the most touching scene in the film when Socheata asked a very innocent question from her father that if ceremonies were conducted for Socheata, the New Year Baby, the father completely broke down in tears. The horrendous carnage was being forgotten by the world and an added goal of the film was to document the bloody past of Cambodia.